The latest in our ongoing series of reports on Lego games is on Magikus, one of the smaller games in the series, which is about collecting ingredients to make a magical potion. The first person to get the full set of four ingredients gets to put them into the little cauldron that comes in the box and, according to Miss B, gets to choose what spell to cast on the losers. Hedwig goes looking for potion ingredients. The game is very simple: there is an owl piece, which you position on the edge of the rack of spell ingredients, so it lines up with one of the rows or columns, then you roll a die. If the die shows the colour of an ingredient that is still in the row or column that you chose, you take that ingredient; alternatively a white result on the die allows you to take anything from the row or column, and a black result allows you to steal from another player. If you end up with a set of the four different ingredients, you win! 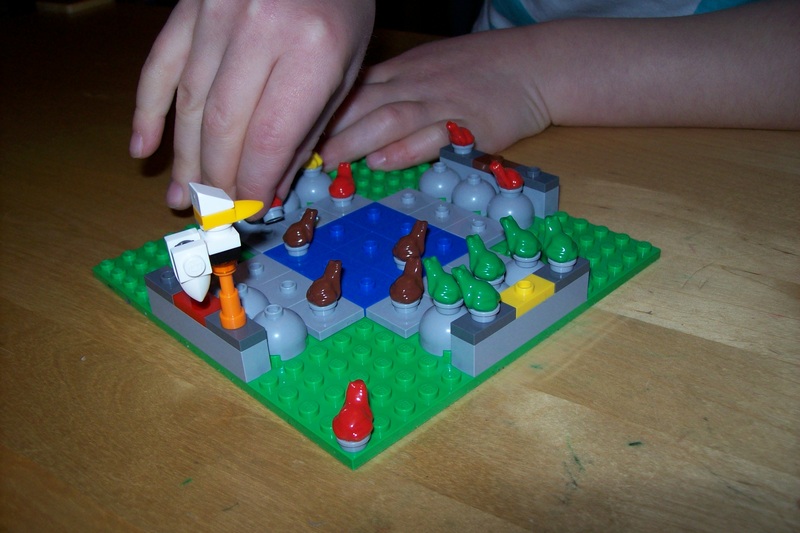 The game: Magikus (Lego), 2 to 4 players aged 6+. Look out for the lava! We haven’t been writing up new games very much lately, largely because we just haven’t been playing that many new-to-us games of late. But now we have cracked open another of the pile of Lego games that we have lying about the place. This time, we have Lava Dragon, a game that involves knights, a dragon and, yes, some lava. The blue knight, having won the race, mounts the dragon and prepares to fly off. Our copy of the game got picked up from a charity shop recently, and the parts were mostly assembled, so we didn’t have the fun of building the whole assembly, but we did spend a little while checking that everything was set up right. It mostly was. 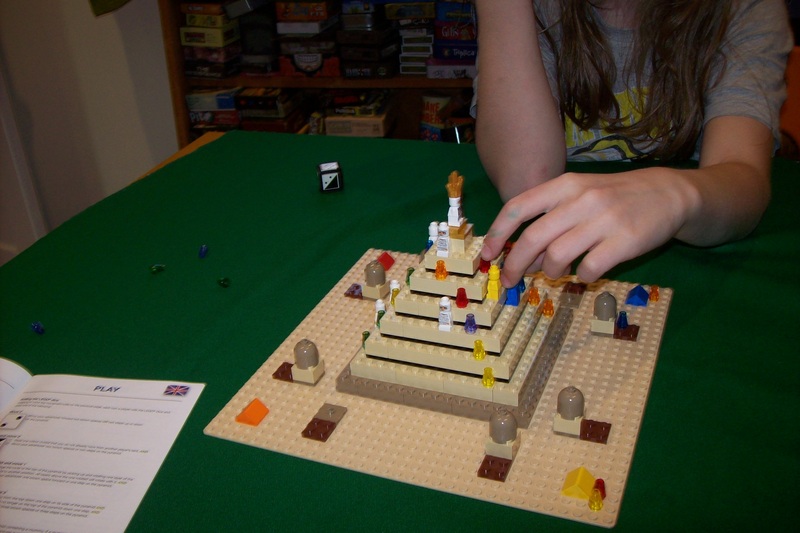 This is one of the smaller Lego games, with a small “board” being a pyramid-shaped mountain, and you move your knight figure up the steps on it trying to get to the top first. Die rolls may make lava move around, potentially blocking your way, and there is an optional rule (which we didn’t use) where the knights can get knocked off the mountain when eruptions occur. The distinctive Lego die in this case starts off with little on it, but gradually changes, so on most turns you get to add a little square onto the side you rolled, meaning you get more movement the next time that side is rolled. And you sometimes get to move on other players’ turns. This part is really quite cool, and means that the game speeds up as it goes along. Like most of the Lego games, though, this is really not very much of a game. I quite enjoyed it though, and Miss B demanded a second game straight after we finished our first. The attraction of a Lego dragon is not to be underestimated. And the way the die is used in this game is, I think, the most interesting variant I have seen yet and one which makes proper use of its Legoness. The game: Lava Dragon (Lego), 2 to 4 players aged 7+. Miss B received a couple of new games for Christmas and her birthday, the first of which was Frog Rush, another in the rapidly expanding range of Lego games. This one is a slight reworking of the old Halma or Chinese Chequers games where you aim to get your pieces to a home area across the board and can speed your progress by leapfrogging over other pieces along the way. Frog Rush has the addition of the random element from the special Lego die, a stork which flies around and eats frogs, and the fact that you can modify the board — there are two layouts described in the rulebook. Overall this played very well and was lots of fun. Or would have been if we weren’t constantly having difficulty with the fiddly nature of the pieces which didn’t work well with either my big, adult fingers or Miss B’s little 5-year-old ones. I’m sure she will get better at this while I will not. This’ll definitely get played again, though it doesn’t have the charm for casual play that Shave a Sheep has. It does, however, have a lot more depth and is a reasonable introduction to more strategic games. Or it would be if the pieces were twice as big (and much more expensive, sadly). The game: Frog Rush (Lego), 2-4 players aged 7+. On Fathers’ Day Miss B proudly presented me with a copy of the Lego Shave a Sheep game. Later that day, we opened it up and spend a happy few minutes assembling the pieces, which include a mean but goofy looking wolf and four sheep. Oh, and it has the special Lego die that you stick different colour tiles onto to affect how the game plays. B has a bit of difficulty with some of the fiddlier bits of construction, but was very pleased with the results. Now, it must be said that this is a game with less than glowing reviews out there (follow the link above and you’ll see some — although alongside that there are positive comments) but this gave us a lot of fun. Play can drag on a bit when someone decides that the best approach is to use the wolf at every opportunity (though this policy didn’t last for ever, thankfully), but making the appropriate noises for the wolf and sheep adds to the fun, the whole thing is cute, the game mechanics are clean and simple, and some decision making is required. All in all, I’d say that Shave a Sheep is absolutely spot on for Miss B right now, and not odious for Mummy and I to play, so win all round really. The rules also suggest ways to vary the rules, from modifying the die (I do really like the die!) to adding a more significant role for the wolf (who, in the standard rules, just sits there as fun but purely decorative fluff). A few other variations also come to mind, so I’m sure we will be experimenting in future. 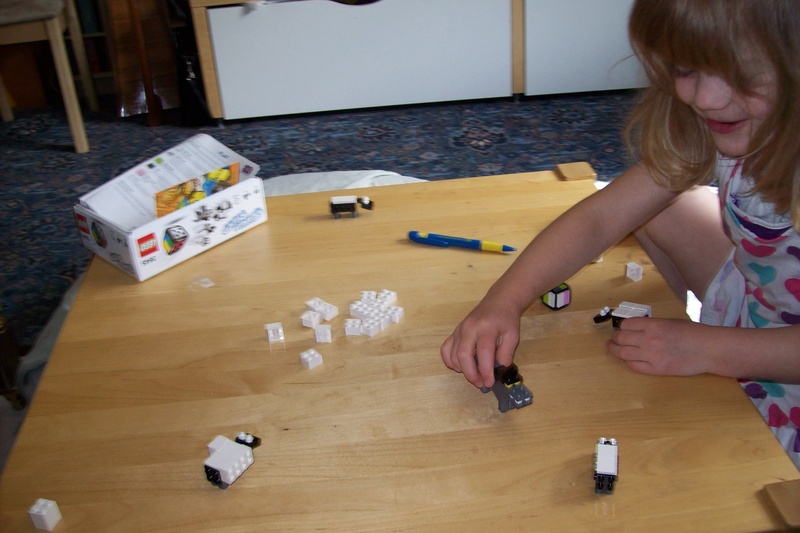 The Game: Shave a Sheep (Lego), 2 to 4 players aged 5+. Careful you don’t go down the pit!